Cultural politics are a category of public action that is slowly disappearing. In the light of inherently economist necessities culture is becoming a topic outside of the conflict of societal ideas. At the same time, the societal postulate of the right does include strategies regarding cultural policy. Culture as a "soft power" is increasingly becoming a stage for the competitive struggle of cities and regions, in which culture is art serves the added value of the catering sector and the services that tourism and the real estate sector have to offer. Culture is degenerating into a security paradigm, inscribing itself into racist discourses, and becoming a central leitmotif of repression and political persecution. Regardless of the increasing complexity of cultural practices and forms of expression, an increasing appreciation becomes visible in geo-political analyses. Cultural factors do not only determine economic connections, but also global conflicts and urban disputes. The cognitive and media industries are gaining importance, and with them the cultural- technological expansion of symbol manipulation. In modern societies, the wielding of power predominantly works in opaque networks of conventions, rules, interpersonal relations, and internalized control. This is what makes a wide debate about culture as a constituent element of social relations and political communities difficult. Who are the actors in cultural politics? 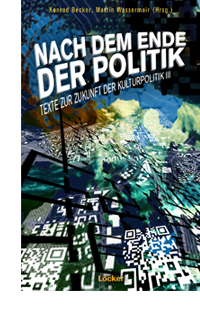 The third volume of the series "Texts about Future Cultural Politics" examines the relation of political action and the cultural field and opens up new strategic perspectives.